Allison Page gets into the Christmas spirit. In the middle of writers meetings for a holiday themed sketch comedy show, lots of stuff is shouted out, lots of things are written, and a whole big gaggle of factors come into play before the final lineup is chosen. Last night, Killing My Lobster had its final writers meeting for KMLZ Holidaze, a gigantic variety show we do as a collaboration with Z Space. There’s music, burlesque, drag, Santas whose laps you can sit on if you dare – and about 50 minutes worth of sketch comedy. It’s a condensed process that goes very quickly. All the writing is done in two weeks, and anyone in the show can submit anything, it’s not just limited to the writers. It can get crazy. But it’s always a hell of a great time. Oh my god, so much Santa. The end of the first writers meeting always concludes with “Okay, guys, we’re done with Santa. We don’t need any more. THE POSITION HAS BEEN FILLED. MOVE ALONG. NOTHIN’ TO SEE HERE.” Which is partially because everyone KNOWS that they can’t get them in after the first meeting, so if they have a Santa idea, it better come runnin’ in at that first meeting. And eventually decisions have to be made about which Santa sketches can live, and which must die. No matter how good they are, there can only be a couple of them before the audience is like “Soooo, this is just a Santa thing now, errrr?” It’s like a Christmas Thunderdome…sorta. Man, we are some dark minded humans. The doom and the gloom came out the first night, as well as the Santa stuff – sometimes in the same sketch. It’s easy, with comedy, to go for the negative. Often that’s an okay path. But with sketch, if you do that the entire time, it’ll be the darkest, most upsetting evening of entertainment you can have. Maybe that impulse is aided by the fact that the holidays often bring out the worst in us, even if just for a moment. You’re surrounded by your family. They’re asking you questions about your job (or lack of job), your personal life (WHEN ARE YOU GONNA HAVE KIDS, PATTY?!?! ), your fashion choices, your dietary choices – just about everything. My grandpa used to make fun of me for wearing red nail polish. Like…what? That’s not even interesting. Then there’s the hypocrisy of the meaning people may or may not assign to the holidays, combined with the commercialism that tends to overpower that stuff. There’s a lot to be Scrooged about. That stuff needs to be tempered with some positivity so the audience doesn’t run out into traffic and throw themselves into the street. Last year I submitted a sketch I wrote about a boy who meets two snowflakes who proceed to tell him that they’re not special, neither is he, he’ll probably just be a barista until he dies, and he might as well start taking anti-depressants now. When the boy says “But I’m not depressed!” the snowflakes respond with “Don’t worry – you will be!” Uh, it didn’t get in. We can’t fill a whole show with covers of carols. I mean, we could, but I feel like a few audience members would start to lose their minds and develop a serious bloodlust, causing mass chaos and zombification. 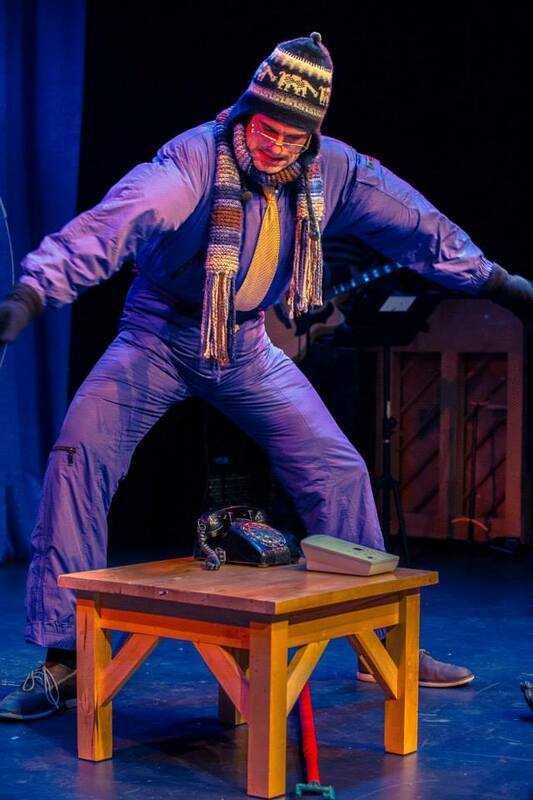 It’s hard to answer the phone in a snowsuit when you have weird low tables. So your sketch made it into rehearsal! Congratulations! Wow, you really beat the odds! 13 writers and your sketch survived, that’s a hell of a thing! But that doesn’t mean it’s going to actually be onstage. About 40 sketches were submitted in two weeks. We’re going into rehearsal with about 18 of them, knowing we can’t fit them all in. In the end, I suspect it’ll be 13-15ish. It’s even possible that something will get all the way to tech and be cut. That always burns a little. So close, and yet so far. Ya can’t win ‘em all. But fear not, friend. If your dog is worth a damn, it’ll have its day…um, maybe. Hopefully. Them’s the breaks. But that’s also the exciting thing about doing this – stuff changes really quickly and you’re flying by the seat of your pants with a bunch of other people who are doing the same. There are a lot of flying pants going on. 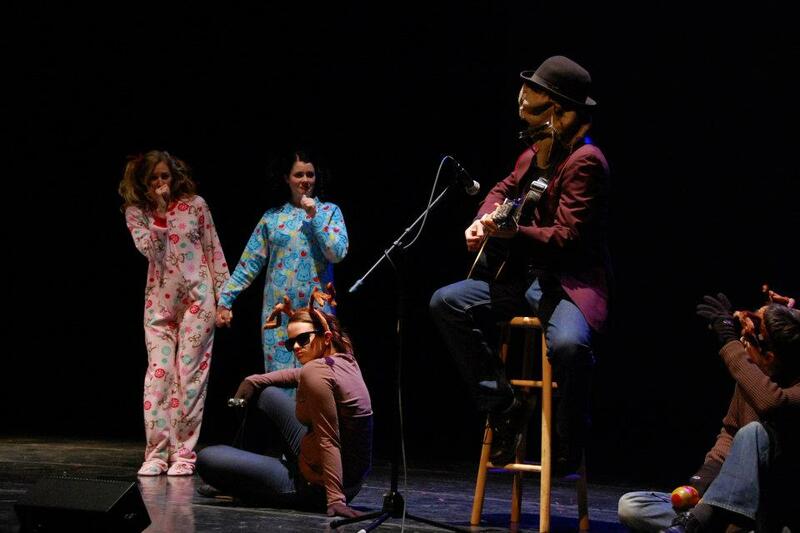 You can see KMLZ: Holidaze at Z Space December 12th at 8pm, and December 13th at 7pm and 10pm.